WITH THE EXCEPTION of Hagia Sophia, no Byzantine monument in the modern city of Istanbul can rival the former church of the monastery of the Chora (Kariye Camii) in either the lavishness and splendor of its interior decoration, the upkeep of its grounds and garden, or, for that matter, the number of tourists from all over the world visiting the site each year in search of the city's glorious Byzantine past. "The Glories of Ancient Byzantium: Mosaics and Frescoes Newly Revealed and Restored in the Church of the Chora" was, in fact, the headline of an article, cut out of the Illustrated London News of 30 April 1955 and marked with the cipher "RB to H K," that ended up one morning, just about two years ago, in my mailbox at Columbia University. What neither my esteemed colleague Richard Brilliant, the prolific donor of this and other notes and offprints on Byzantine art and architecture, nor I realized at the time was that this clipping would provide crucial inspiration for me to organize an exhibition on the very restoration hailed in the article as having revealed the glories of ancient Byzantium. Reading the news clipping on the recovery of the mosaics and frescoes of the Kariye Camii, I remembered that several years earlier, while doing research at the Dumbarton Oaks Center for Byzantine Studies in Washington, D.C., Helen Evans, the Curator of Early Christian and Byzantine Art in the Department of Medieval Art and The Cloisters at the Metropolitan Museum, had come to look at a number of largescale replicas of several of the frescoes in the Kariye Camii's parekklesion. Painted during the Byzantine Institute of America's restoration of the building in the midI950s, these facsimiles had been rolled up and stored in the basement of Dumbarton Oaks since the completion of the institute's work in Istanbul. The canvases had never been put back on stretchers after their arrival in Washington, and therefore they had never been exhibited. Back in the fall of 1999, Helen Evans had just entered into the planning stages of a Late Byzantine sequel to the Middle Byzantine blockbuster The Glory of Byzantium: Art and Culture of the Middle Byzantine Era, A. D. 8431261 and had come to Dumbarton Oaks to see if these canvases could somehow be incorporated into the future exhibition Byzantium: Faith and Power (1261–1557). As I learned from Helen Evans about two years later -- shortly after the retrieval of the news clipping from my Columbia University mailbox, in fact - this plan had never materialized. Since the Metropolitan Museum of Art no longer intended to use the Byzantine Institute's fresco replicas in its exhibition, the possibility arose of developing a separate but concurrent exhibition of these replicas at Columbia University's Wallach Art Gallery, a space established in 1986 through the generosity of Miriam and Ira D. Wallach and operating under the auspices of Columbia's Department of Art History and Archaeology. Download the foreward, in full, as a pdf. Download the publication acknowledgments as a pdf. Download an introduction to the Kariye Camii by Robert Ousterhout. 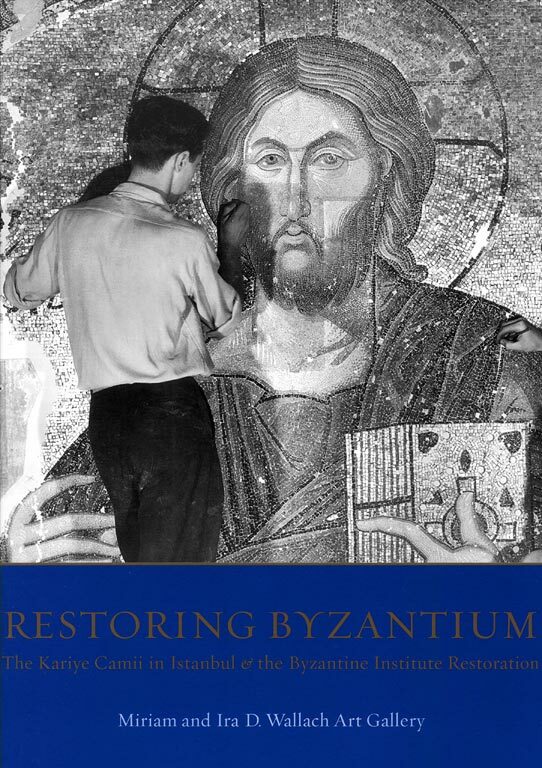 "Restoring Byzantium" cover. Click image to enlarge. 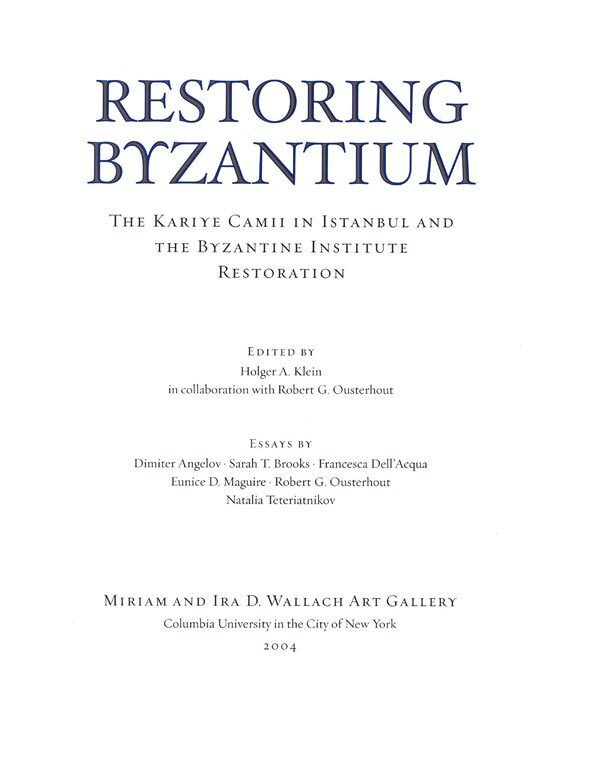 "Restoring Byzantium" frontispiece. Click image to enlarge.